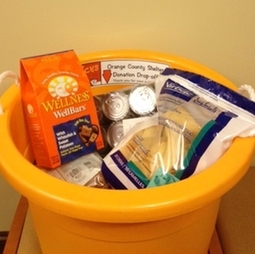 We are a donation Drop-off Site for the Orange County Humane Society, & Cause 4 Paws. For OCHS, we take donations of canned food, cat & dog treats; towels, toys, collars & leashes in good conditon; laundry supplies,e tc. which go to the Orange County Animal Shelter. Monetary donations are also accepted at the front desk donation jar. We thank you for your generosity and continued support. Cause 4 Paws is a local feline rescue group. We accept donations of food, litter, cat toys, and other small cat supplies. For larger items, please contact Cause 4 Paws directly.